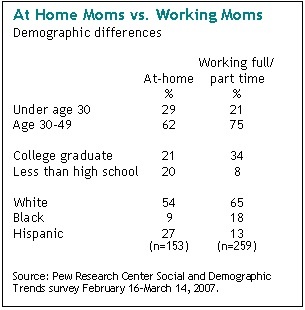 37% of women polled, compared to 79 % of men said they would prefer to work full-time. 62 % of women and only 21% of men said they would be prefer to work part-time (and thus help out more with child rearing). Regarding stress, 86% of working moms said they sometimes frequently feel stress compared to 74% of working dads. 19% of the general American public agree that women should return to their traditional roles while 75% disagree.